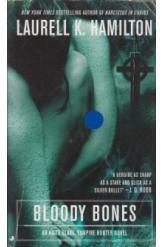 Bloody Bones Laurell K Hamilton Sci Fi. Book is in good condition, all pages intact. Experienced vampire hunter Anita Blake confronts a new kind of challenge; raising an entire, three hundred year old graveyard's worth of corpses to resolve a mysterious string of murders. The victims, a trio of Missouri teenagers, were slain by something Anita has never encountered before.